Joseph Azam says he left his senior post at News Corp. in late 2017 over the coverage of Muslims, immigrants and race by Fox News and other Murdoch news outlets. Fox News star Tucker Carlson has been on the defensive over seemingly racist anti-Iraqi remarks he made years ago. Azam says he took down his 2017 tweet reply after his boss told him not to attack other figures in the Murdoch empire. 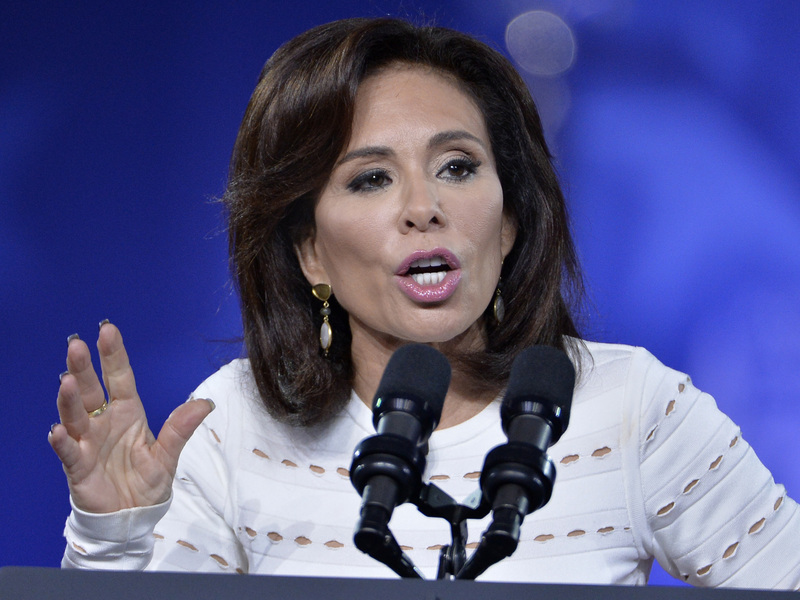 In recent days, Fox News has found itself forced to condemn recent anti-Muslim commentary by Jeanine Pirro, an opinion host with close ties to President Trump. "It was very eloquent, mostly. ... It was policy-backed, at a certain level," Azam says. "In a very subtle and eloquent way, it was kind of like the stuff that would happen in the [New York Post], dressed up in a tuxedo." As an example, Azam pointed to an opinion piece in the Journal by two leaders of a right-wing, populist Swedish political party claiming violence rose along with greater immigration in Sweden — though subsequent news coverage elsewhere seemingly debunked it. Under former Journal Editor Gerard Baker, Azam says, even the news coverage of the Trump administration's initial Muslim ban "seemed to be aimed at shaping the narrative for the White House, to move away from talking about the fact that religion was being targeted." Some journalists agreed, as NPR and other outlets reported at the time. In recent days, the Fox News Channel and some of its corporate siblings have come under renewed criticism for their rhetoric on Muslims and immigrants. Advocacy groups have launched a fresh wave of boycotts against Fox stars such as Tucker Carlson and Jeanine Pirro. Fox is controlled by media magnate Rupert Murdoch and his family. Now, in an exclusive interview with NPR, a former senior executive for the company says he quit because of the rhetoric at Fox. NPR media correspondent David Folkenflik has the story. DAVID FOLKENFLIK, BYLINE: Joseph Azam joined Rupert Murdoch's News Corp in fall 2015, and it was something of a homecoming. JOSEPH AZAM: I started out practicing in Manhattan as a lawyer, and actually my office at News Corp looked over a corner near Rockefeller Center where my dad used to sell newspapers. FOLKENFLIK: Azam, now 37, is in many ways the embodiment of the American dream. 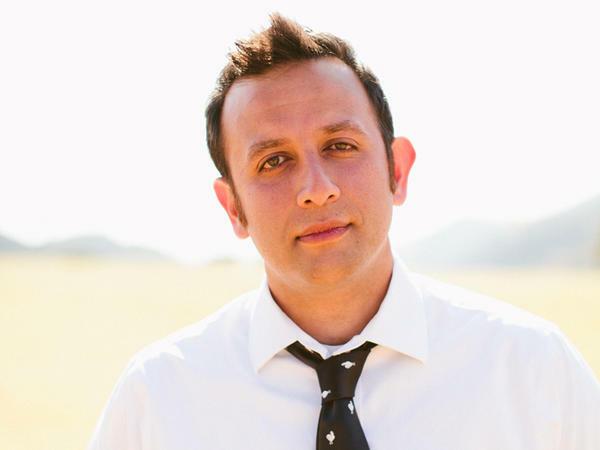 He was born in Afghanistan and brought to the United States by his parents as a toddler, a Muslim immigrant and war refugees seeking safety after the Soviet invasion. He says he knew the controversies that defined Rupert Murdoch and his media properties but figured it would be fine. Azam says the coverage was much worse than he had prepared for. AZAM: Scaring people, demonizing immigrants, creating, like, a fervor - right? - an anxiety about what was happening in our country. FOLKENFLIK: Azam was a senior vice president at Murdoch's News Corp, the chief compliance officer for its corporate headquarters, The Wall Street Journal and The New York Post, among other properties. And what Azam saw from his colleagues on Fox News and read in the pages of the Post and the opinion pages of the Journal upset him. AZAM: My issue with this isn't as an American Muslim. It's not as a refugee. It's not as an immigrant. It's as an American. FOLKENFLIK: Executives at Fox News and News Corp all declined comment for this story, yet Azam says it's gotten worse. In recent days and months, Fox News has faced new outcries. Take Jeanine Pirro. JEANINE PIRRO: Think about it. Omar wears a hijab. FOLKENFLIK: Here Pirro was earlier this month talking about U.S. Representative Ilhan Omar. Omar's remarks on Israel sparked controversy and condemnation, but Pirro singled out Omar's Islamic faith and veil. PIRRO: Is her adherence to this Islamic doctrine indicative of her adherence to Sharia law which in itself is antithetical to the United States Constitution? FOLKENFLIK: After an outcry, Fox News declared Pirro did not reflect its values. She was off the air last week and will be off this week as well. 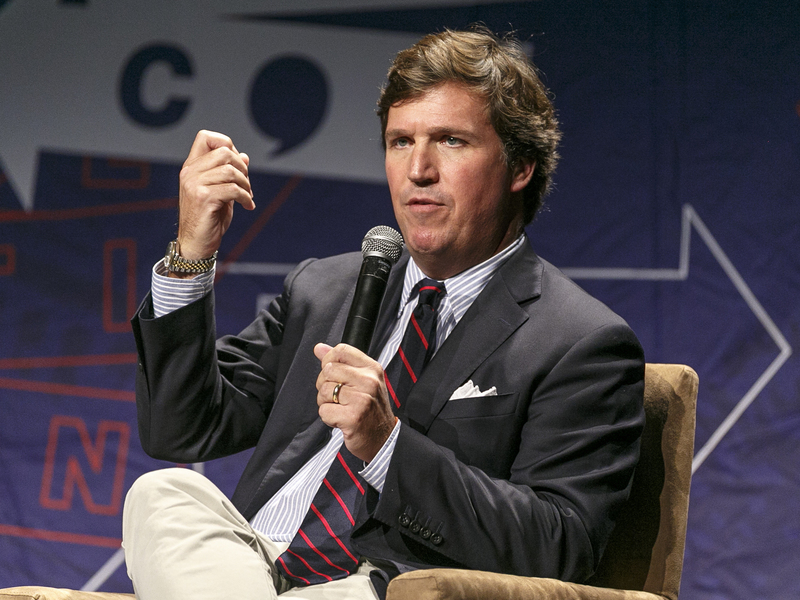 The liberal group Media Matters found a trove of offensive comments Fox's Tucker Carlson made on a shock jock radio program some years ago, such as this jibe about Iraqis in 2008. FOLKENFLIK: In case it was hard to hear, Carlson called Iraqis a bunch of semi-literate primitive monkeys. Carlson and Fox brushed off the controversy as a free speech matter. Critics say it fits in with his anti-immigration line on his primetime show on Fox. CARLSON: Our leaders demand that you shut up and accept this. We have a moral obligation to admit the world's poor, they tell us, even if it makes our own country poorer and dirtier and more divided. FOLKENFLIK: A Muslim producer for Sky News Australia resigned last week citing that network's coverage of Muslims. It is owned by News Corp. Fox News is technically part of a separate company, the slimmed down Fox Corp. Yet both News Corp and Fox Corp are ultimately controlled by Rupert Murdoch and his family, a point that was underscored when Azam got in a Twitter exchange with Fox's Tucker Carlson in June 2017. Carlson asked why America should absorb, quote, "tons of people from failing countries." 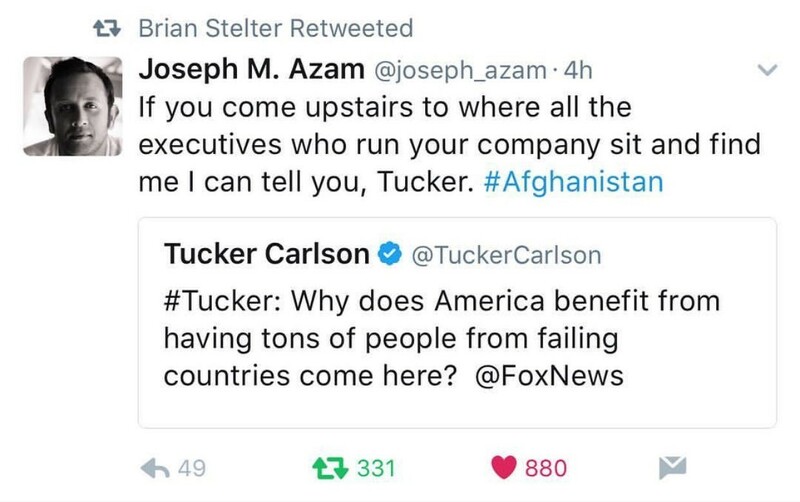 Azam shot back that Carlson should, quote, "come upstairs to where all the executives who run your company sit, and find me." By Azam's account, his boss advised him he was crossing a line, and Azam deleted his tweet. But he found it hard to take. AZAM: I live here. I have kids here. And it worries me that, you know, what's being put out into the universe could actually create a lot of risk for them. FOLKENFLIK: By December 2017, Azam had resigned, saying he could not reconcile his employer's apparent values with his own. David Folkenflik, NPR News, New York. Transcript provided by NPR, Copyright NPR.